Flood victims around the UK left to suffer! People who fell victim to the devastating floods in many parts of the UK have been left to face the aftermath alone. Tories had vowed to help members of the public clearly stating that “money is no object” however, it recently came to light that the public would not be receiving any financial help at all even though many people had their homes severely damaged by the flood waters. A couple of years ago Waverley Council had distributed a sum of £7,000 per individual household located in Catteshall Road to be spent on modifying existing flood defences in each of the houses. This included the use of air bricks and flood guards however; these fixtures have visibly failed to work correctly consequently resulting in flooded homes. 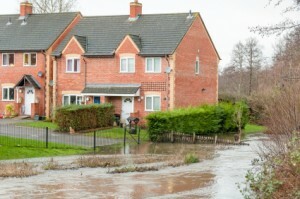 Every house had been engulfed in water when the nearby River Wey had ruptured its banks and the flood waters rose to a depth of several inches. Residents occupying this street in Surrey had been informed that they would be unable to obtain any fees towards the restoration of their homes and anything else that may have been damaged. Even though the Council had been verbally supportive towards members of the public that had been affected, they ended up writing a letter to a resident in the street disgracefully implying that they would not be held accountable for any reparations or forfeiture inflicted by the contiguous flood waters. In response to the letter, 49 year old Ms Stanley said; “We have been told it’s not their problem. David Cameron promised to help people, but there’s no help for us”. Ms Stanley’s neighbour who is a mother to two children, Hannah Scott revealed that she had been due to sell her home however, due to the flood waters the sale had been retracted evidently because there had been widespread damage done to the property. They had been offered a type of flood insurance but the extortionate price had been too much for her to afford resulting in her property not being covered for the current damage caused by the flooding. The Prime Minister David Cameron had labelled the widespread rising waters a ‘national disruption’ and had vowed only last month to distribute all the necessary expenses to cover the costs of helping members of the public affected by these waters. During this explanation he claimed; “Money is no object in this relief effort”. A spokesman from Waverley Council Stated; “The Government has set some conditions for the repairs and renewals grant and further details are still awaited about how this scheme will operate”. Would you leave these people in a pit of desperation and helplessness? Feel free to leave your views below.